GSM Alarm Part Function: Alarm report by SMS and auto dial; Arm/disarm by SMS; Listen-in the spot; Message storage when power off; Built-in Lithium Battery; Sound/mute alarm; Remote control thru mobile phone; Support 5 remote control and 16 wireless sensors. Additional 3 USD for Quad band GSM system; Additional 3 USD for wireless siren simultaneously controlled thru mobile. 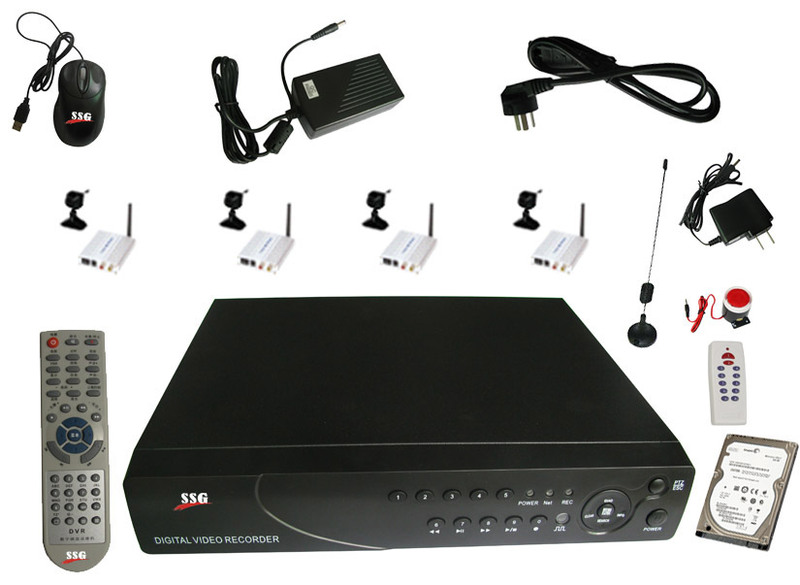 Standard Units: the standard units of the 4 Channel DVR, 4 Mini Camera, 4 BNC Connector, Built-in Lithium Battery, E×ternal Siren, 1 Antenna, 1 Programming Keypad. .Bookstore: Nowadays, the optional bookstores are very popular. It is very connivient for the customer. While as for the bookseller, they suffer heavy loss because of the stolen books. While with this Mini DVR, the user can monitor the bookstore with this products. The bookseller can choose the Mini Camera and a Monitor that with can be automatic switched timely. .Home: The user can montior the car, motorcyble or bicycle that you put outside the house temporaryly. The user can also use it to monitor the baby. .Supermarket Only with installation of some CMOS Mini Cameras in a suitable place and a Monitor that with can be automatic switched timely, the shop assistant can monitor the whole supermarket to know what happens. .Elevator: The elevators are always very confined, so it will bring many difficulties. Fo r e¡Áample, when the power supply failed, the buliding management can not know what happened and if there is people in the evevator. If we install a Mini Camera in the elevator, we can slove all the problem. .Video Intercom System. The video door phone system are very e¡Ápensive, so many families cannot consume this products. While this DVR System will solve this problem. As we know the CMOS Camera has a good cost-effective, it is affordable to the customer. The customer can buy some Mini Cameras and install them at the door. If there is a visiter, the customer can view the video of the visiter on the monitor. .Bank: We can install a Mini Camera above the bank bar to monitor the bank teller and the customer, so that the conflict and misunderstandings between the baks teller and the customer will become less. .The Sytem can be used in prison and Criminal Investigation area snd some other places. .In some special places, if we use camera to monitor the place, it will cause some misunderstanding and conflicts. While this Wired Monitor System are very concealed, so we can use it in the necessary places. .We can use the wireless Mini camera in the bussiness negocation. HOME \ PRODUCTS \ SUPPORT \ MANUFACTRURE \ DEMO \ CONTACT Copyright 2006 © Shenzhen Security Group Corp.,Ltd.